Protesters rally against police brutality at City Hall Park in New York City on Aug. 1, 2016. The majority of black millennials in the United States wanted Sen. Bernie Sanders (I-Vt.) to be their next president, but since he's out of the race, 60 percent of black millennials said they would vote for Democratic presidential candidate Hillary Rodham Clinton if the general election were held today. Why? Because 78 percent of black millennials believe Clinton to be qualified to hold the office, while only 14 percent believe that Republican presidential candidate Donald Trump is qualified. Unlike their Asian-American and Latinx counterparts, the majority of black millennials find Clinton to be "honest and trustworthy," while Green Party presidential nominee Jill Stein is barely registering among the same demographic—only faring worse than Libertarian presidential candidate Gary Johnson. This is the interesting—and, perhaps, unexpected—snapshot of the 2016 presidential race that developed from the results of GenForward's (pdf) August 2016 survey, illuminating contrasts among millennials on issues ranging from politics to policing in the United States. GenForward is a survey of the Black Youth Project at the University of Chicago with the Associated Press-NORC Center for Public Affairs Research. Some of the survey's most compelling findings center on race, racism and policing, with 1,750 young adults ages 18-30 being asked specifically how race and ethnicity shape how they experience and think about the world. As issues of police brutality and systemic racism continue to be centered in the Movement for Black Lives, the GenForward responses in those categories are of particular interest—including that 66 percent of white participants believe that Black Lives Matter "rhetoric" encourages violence against police. As far as what issue should receive priority treatment, for black participants, police brutality, racism and education—in that order—are the primary concerns. The primary concerns for Asian-American participants are gun control, terrorism and homeland security. For Latinx-American participants, the primary concerns are terrorism and homeland security, education and immigration. And for white participants, environment and climate change, and terrorism and homeland security, are the primary concerns. 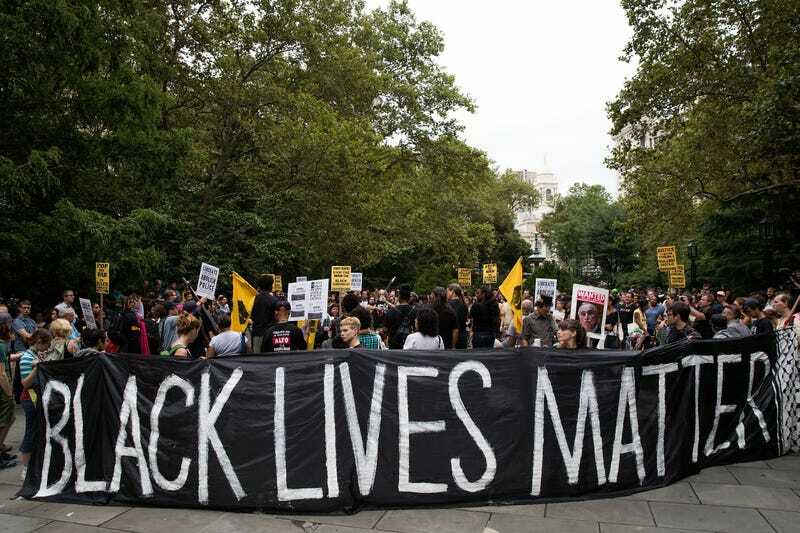 White participants were also less likely to believe that the extrajudicial killings of black Americans were a part of a larger institutional and systemic issue. When it came to grading the performance of President Barack Obama, the results expose how polarized the United States is along racial fault lines. Sixty-five percent of black participants "strongly approve" of Obama's job performance; 37 percent of Asian-American participants "strongly approve of his performance"; 40 percent of Latinx-American participants "strongly approve"; and only 18 percent of white Americans "strongly approve." The difference is striking. White participants ages 18-30 are very much still beneficiaries of racism, and that shows in many of the responses recorded in the GenForward survey. From immigration to terrorism to a glaring lack of depth on the issues of police brutality and institutional violence against people of color, it appears as if many white millennials want "to make America great again," even if they aren't voting for Donald Trump, or find the status quo much more comfortable than millennials of color do. And the absence of awareness and intent is arguably the most dangerous form of racism there is. As a more intersectional movement work continues to build, with a sharpened focus on inclusion and equity on issues ranging from employment to health care, it will be interesting to see how—or if—these percentages shift in the coming months, particularly after the general election in November. GenForward is the first survey of its kind, and The Root will be bringing our readers the results each month. Read through the entire GenForward survey here (pdf).